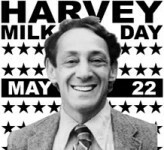 Harvey Milk was one of the first openly gay politicians ever to be elected and serve in a United States public office. Upon arriving in San Francisco in 1972, Milk opened his iconic camera store in the famed Castro district, and became increasingly involved in promoting local businesses in the area. A longtime proponent of equal rights for all and an unapologetic advocate for the LGBTQ community, Milk became the unofficial spokesperson for the gay rights movement, and campaigned for a seat on the San Francisco Board of Supervisors. Upon losing both his first and second election for the Board of Supervisors, in 1975 he was appointed to the San Francisco Board of Permit Appeals by his ally and friend, Mayor George Moscone. In 1977, Milk’s luck eventually turned and he was elected as the San Francisco city-county supervisor, a huge victory for the LGBTQ community worldwide. As supervisor, Milk sponsored an anti-discrimination bill, fought to establish daycare centers for working mothers, helped to increase low-cost housing options, and consistently advocated for the rights of all marginalized communities. During his term of service, Milk played a role in defeating Proposition 6, which would have permitted the firing of gay teachers in California public schools. As both a community organizer and public official, Milk made an impact on not only his community, but on future leaders to follow. It is because of people like Harvey Milk, his predecessors, and the leaders of today that we are able to come together and defeat discriminatory practices and legislation that affect our communities. His leadership style relied heavily on prioritizing diversity, and empowering marginalized communities to make the changes they wanted for their neighborhoods. A trailblazer who refused to falter despite lost elections and a constant barrage of death threats, we celebrate him on his 85th birthday for all he did to promote equal rights and opportunity for all. This entry was posted in History, LGBTQ and tagged accomplishments, assassination, Briggs Initiative, California, Castro District, discrimination, gay rights, George Moscone, Harvey Milk, Harvey Milk Day, LGBT rights, LGBTQ, Proposition 6, San Francisco, San Francisco Board of Supervisors by Michelle P.. Bookmark the permalink.